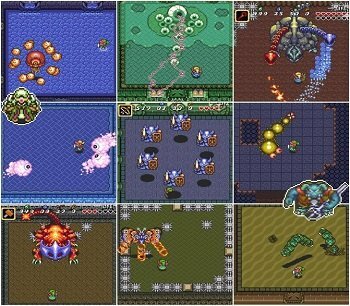 Do you need cheats + codes for Zelda A Link To The Past on the Super Nintendo? Your in luck as this page contains all the cheats and codes you will need. 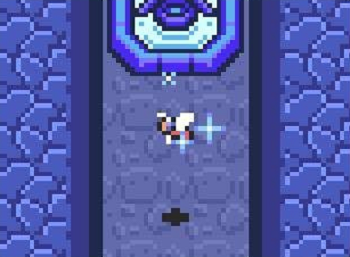 Bee to Help You Defeat Enemies – If you would like a bee to help you defeat enemies, travel to the cave where you otherwise obtain the Ice Rod. Enter through the standard opening (not the secret path that leads to the Ice Rod) and sash against the statue that waits at the end of the passageway. A golden bee will appear, which you should capture with your net and store in a bottle. You can open the bottle when you’re ready to unleash the angry bee and bring vengeance upon your foes. Hookshot Invincibility – When you fire the hookshot, no matter how far it extends, you will be invincible during its duration. Enemies will pass right through you. Use it to your advantage if you’re surrounded. Unlimited Rupees – In the normal world (not the dark one), go to the area before the desert, just to the west of the swamps. Lift the large green rock to reveal a secret cave entrance underneath it. Enter this cave and lift the pots to find a total of 50 rupees. 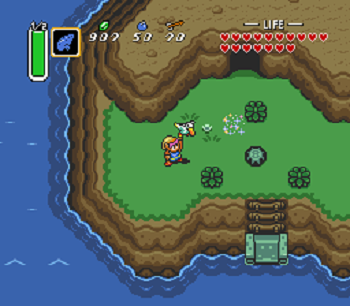 Go back out and re-enter this cave again and again to keep gaining rupees. Free Green Potion – Throw an empty bottle into the fountain at the Waterfall of Wishing. The faerie who appears will give you a free green potion. 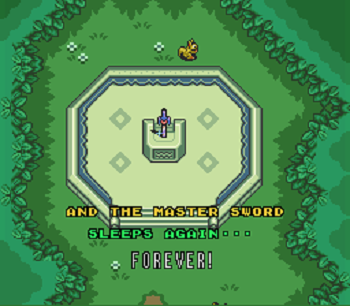 How To Beat The Game In 5 Minutes – Start a new game and head to Hyrule Castle to your sword, then follow the path to go in. Once inside the first main room, climb the center steps and walk to the ledge just to the left. Hop off the ledge and press ‘Select’ mid-air, then choose to save and quit the game. Reload your save and make your way back into the castle, but make sure you don’t touch any of the guards along the way. If you do, you’ll need to repeat the last step. Go up the stairs again, but this time exit through the door to the left. Wait for the blue guard to turn around (or slash him once to get his attention), then press left on the D-pad to continuously run up against the left wall just as the guard hits you. At this point, Link should disappear, now under and inside of the wall. Walk straight up until the screen changes, then go straight up one more screen and stop. Walk to the right using Link’s hat peeking through the wall as a guide, then stop when it disappears into the right wall. Make sure you don’t go another screen over, and don’t step out of the wall. Now just hold up on the D-pad and you’ll eventually walk past Ganon and into the final cutscene of the game! So what’s going on here? When you save and quit mid-air, the game registers Link as being on a level lower than he actually is. Getting hit by a guard will reset this, which is why the glitched state breaks if you touch one too soon. But hitting the right guard while on the upper level will drop you beneath the floor, letting you walk into (under) the wall. Fat Ferry – Near the end of the game in the dark world, you will see in the pyramid that there is a crack in it for a bomb to blow up. An ordinary bomb wo’nt do the trick, but a super bomb will. How To Get Magic Powder – In the light world, when you are in the dark forest, you will see a rotted mushroom, you are allowed to put it in your item stash. It doesn’t do anything, but take it and go to the witch who is brewing something beside the potion shop. Give the mushroom to her and she will say that she will give you something in return. So go in the shop, and beside the little guy sitting there, is a bag of magic powder. How To Beat Gannon – When you get to the last boss, here’s how to defeat him. Hit him a couple of times with your sword. He should throw his dagger at you. Try to avoid it. Do this another time. The third time you do this, he will twirl his dagger. Little fireballs will form around it. The balls will expand. Soon they will turn to fire bats. These bats take away 2 hearts. Try to avoid them. Keep hitting him with your sword. Do this step 3 times. When you finish, his dagger will be gone. Now his usual attack will be a power stomp that lets out a fire bat, that will make fire balls in its path. When he stomps, the floor will cave in on one side. If you drop through this, there will be 2 chests with treasures to help you. He’ll stomp 4 times. Then the lights will go out. The 2 torches at the end of the room will go out. Light them with your torch or fire rod to see him. Hit him with your sword, then he will freeze. Quickly equip your bow and silver arrows. Shoot him once. The lights will go out again. Light them a second time to see him again, and hit him with your sword again. Equip your bow and shoot him with a silver arrow. Do this 1 or 2 more times and he will be defeated. A door will open and a bridge will appear. Go in the door to receive the tri-force. You have conquered the game! The Lost Woods with Dark World Enemies – In the Dark World, go and stand EXACTLY where the mushroom is in the Light world(Somewhere in the Skull Dungeon). When you use the Magic Mirror to go back to the Light World,not only will you get the Mushroom but the trees will be glitched and you’ll be able to fight some of the monsters that are only in the Dark World! When you leave the forest, everything will go back to normal. How To Get The 4th Jar – Here is how to get the 4 Jars where you can stock potions, faeries and other things. 1: One man in Kakariko Village sells one for 100 rupees. He can be found easily since there’s a lot of bottle around him. 2: Still in Kakariko Village, search for a hidden entrance behind a big house. Inside, there’s a chest, which contains the second bottle. 3: Go in the river in north-east Hyrule. Swim under the bridge to find a strange camper. Talk to him and he will give you the third bottle. 4: After completing the fourth Temple in the Dark world, go to the place where there is the Blacksmith’s House in the light world. There will be a locked chest in the broken house. Take the chest to the man at the entrance of the desert, without running. The man will open the chest for you, revealing the fourth and final bottle. How To Aquire Invisibility Cape Early – There is a way to get the Magic Cape right after you get the Hammer in the Palace of Darkness(Dark World’s 1st dungeon). In the graveyard in the Light World you’ll notice there are dark colored rocks with the number 8 on the them surrounding a tombstone, but if you go to the same place in the dark world you can cut down a flower and dash into a pile of rocks that usually reveals a red ruby(worth 20 rubies). In this place you need to use your Magic Mirror north of the rock pile. If you’ve done this right you can circumvent the dark colored rocks in the Light World. 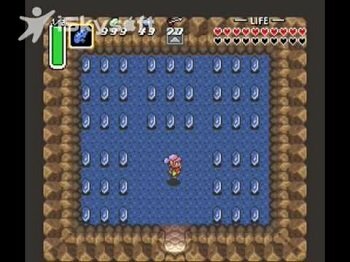 Back Track For 300 Rupees – Do you remember early in the game in the catacombs where there were two bombable walls and no way to bypass them? I know I do. Here’s a way to get through them. First and foremost: Get some bombs. There are two (2) holes, so try for two (2+) bombs at least. 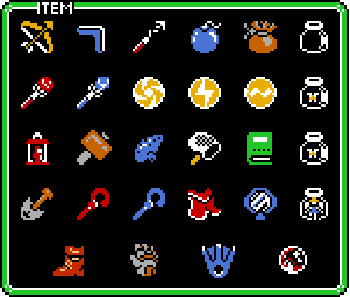 Now you need either the power glove or titans mitt, it doesn’t matter which. Now, go to the graveyard. You can move the gravestones by walking up (^) into them. Near the upper left hand corner, there is a grave with two (2) boulders in front of it. Remove them at once. Push up on the gravestone and you’ll fall down a hole. Recognise this place? Bomb the walls. There are six(6) pots and three (3) chests. The chest in the center has 300 rupees inside it. Upgrade Your Shield – Like the guy with the boomerang and potion cheat up the page a little bit, throw your shield in. you’ll have a bigger better shield. Extra Arrows/Bombs – If you have the flippers, load your game and start from your house. GO south one screen and then head right. Jump in the lake and swim until you get to the island which has the stones in the water in front of it. Go in and throw 100 rupies in the water. A farie will come up and ask which you want more of, Arrows or bombs. Just choose one and throw 100 more. Just repeat until the farie says your are maxed on bombs and arrows and she can do no more for you. By the way, there are about 4 extra faeries in the room to the right if you feel like putting them in bottles. Free Magic Potion/Magic Boomarang – Once you get your flippers from King Zora(King Fish or mabye Fish god) go to the fountain area north east of the witches house. You will see the waterfall. Swim into that and you will see a little isolated pool of water. Walk to it and choose to throw your boomarang into there. Once you do that, you will get your boomarang upgrade….its faster and goes farther. Next choose to throw an empty bottle in and you will get a free green magic potion which fills up your magic all the way. Hidden Rupees – Go to the village with the patrolling people and go to the one with a brownish-tan clothes. Go inside her house. Then all the way in the back is a Mario picture. Pull on it and you get 4 green, blue, or red rupees. 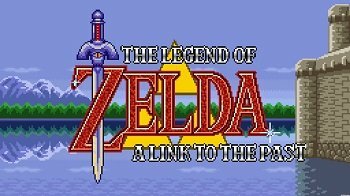 There are a few things you can unlock in Zelda A Link To The Past snes cheats they are listed below. 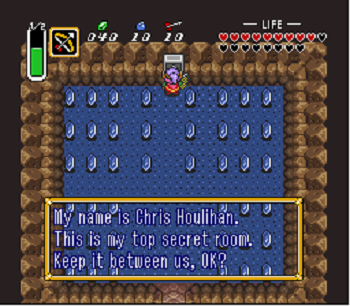 Top Secret Room – After you have maxed all your equipment, collected all the crystals, and beaten Ganon, go to the light world. Proceed to the castle, and go around to the right to the secret entrance you used at the start of the game. Fall through, and you will find yourself in a room full of rupees and a triforce tile. The tile says, “My name is Chris Houlihan. This is my top secret room. Let’s keep this between us, OK?” The door out will lead out the doorway of Link’s house. In order to access the room again, you must beat Ganon again. This room contains nothing special, just 225 rupees all told. If you need a little help with the boss battles in this game we have the information you need below. Boss 1 Soild Soilders – when there moving aim with your Bow and arrows on all of them. Boss 2 Giant Sand Worms – hold the attack button near a hole let go of the attack button. Dark Boss 2 Arghus – After find Arghus you need to get those baloon thing off first Hookshot then sword after Arghus is bare hold B and after he comes you should let go. Dark Boss 3 Mothula – After going down the square crack you will find a giant moth first use your Fire Rod after your Magic Power is gone Use the B button to attack Mothula. Dark Boss 5 Kholdstare – First Kholdstare is stuck in ice use your Fire rod until Kholdstare is free you can start fight but there is three Kholdstares charge Link’s Sword then keep on hitting them until one is left keep on hitting it then you’ll get a piece of a heart. Dark Boss 6 Gannon – When you get to the last boss, here’s how to defeat him. Hit him a couple of times with your sword. He should throw his dagger at you. Try to avoid it. Do this another time. The third time you do this, he will twirl his dagger. Little fireballs will form around it. The balls will expand. Soon they will turn to fire bats. These bats take away 2 hearts. Try to avoid them. Keep hitting him with your sword. Do this step 3 times. When you finish, his dagger will be gone. Now his usual attack will be a power stomp that lets out a fire bat, that will make fire balls in its path. When he stomps, the floor will cave in on one side. If you drop through this, there will be 2 chests with treasures to help you. He’ll stomp 4 times. Then the lights will go out. The 2 torches at the end of the room will go out. Light them with your torch or fire rod to see him. Hit him with your sword, then he will freeze. Quickly equip your bow and silver arrows. Shoot him once. The lights will go out again. Light them a second time to see him again, and hit him with your sword again. Equip your bow and shoot him with a silver arrow. Do this 1 or 2 more times and he will be defeated. A door will open and a bridge will appear. Go in the door to receive the tri-force. You have conquered the game!